More than one homeowner has struggled with skunks, raccoons, armadillos, moles, or crows and other large birds devastating a turf lawn by digging it full of holes, never realizing the real cause. These animals do not dig for the fun of it, but because there is something under the ground that they are after. That something is grubs. Many hard-shelled beetles found in the residential landscape may infest the ground with their larvae, which collectively are known as grubs. Japanese beetles and June bugs are some of the common beetles that can infest lawns and gardens with the ugly white or yellow grubs that can eat the roots of garden plants and lawn grasses. In most cases, this is what the small animals and large birds are after in your lawn. Control the grubs and you control the animals digging up your lawn. Normally, a small amount of feeding in your lawn by birds and small creatures is not a cause for alarm, but a form of natural pest control. There is no reason to leap to methods for attacking the animals and birds themselves, and in many cases, it's best to do nothing. Birds poking holes in your lawn not only rid your lawn of damaging grubs but they also naturally aerate the soil. Some of the many birds that eat lawn grubs include crows, starlings, grosbeaks, magpies, robins, and blue jays. In fact, the more birds in your yard, the better your garden and lawn will be in terms of pest control. 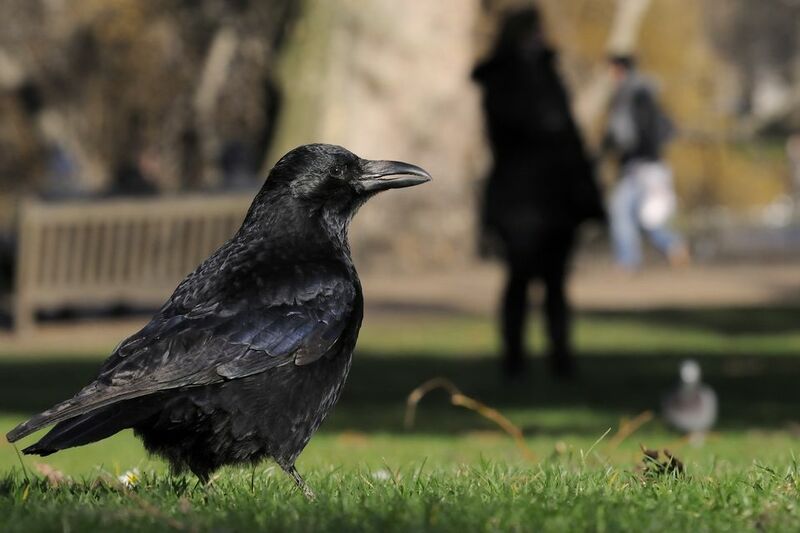 But large birds and small animals can devastate a lawn if the grub problem is very severe, and the answer is not to attack the birds, but to get at the source of the problem -- the lawn grubs that these animals are feasting on. If you suspect you have a grub problem, take a closer look at your soil profile. If you have more than five grubs per square foot of lawn, it is considered an infestation and action should be taken. It is not hard to determine if you have grubs. The dead patches of lawn have had their roots severed, and if you pull back on the patch of dead lawn, it will come up easily. If you have a grub problem, you likely will see the ugly white or yellow C-shaped grubs just under the turf layer. Consider if your problem is severe enough to warrant treatment. A few animals that dig a few holes in search of a few grubs in an otherwise healthy lawn and garden is really not much of a problem. Apply beneficial nematodes to your lawn. Nematodes are microscopic worms. In their larval form, nematode worms eat grubs. Nematodes can be purchased at garden centers or from online retailers. Spread castor oil granules over your lawn. This will control grubs, and with the grubs gone, so will be the moles, skunks, raccoons, crows and other creatures eating the grubs. Apply neem oil to garden plants to discourage Japanese beetles and other hard-shelled beetles. Controlling the beetles themselves will prevent them from reproducing and infesting the lawn with their larvae. Synthetic chemicals should be a last resort and only used after natural solutions are attempted. When purchasing a chemical control, remember that products containing Merit (imidacloprid) or Mach-2 (halofenozide) are for treating the insect eggs in the spring and are useless for late summer/early fall applications. When the grubs are already present, it will be necessary to use a chemical like Dylox (trichlorfon) or Sevin (carbaryl). Be sure to water in the product to get results. It will be useless unless it penetrates down beneath the turfgrass root level. And always follow label directions precisely.